Norway, Michigan resident Nicole Gillis, 37, Escanaba resident Cynthia Ogren, 56, and Wilson resident Sharon Philemon, 59, pleaded not guilty Social Security disability fraud on Wednesday, November 2. Wilson and Ogren were charged with false pretenses – $1,000 or more but less than $20,000 – while Philemon was charged with embezzlement from a vulnerable adult – $1,000 or more but less than $20,000. In a related development, 38-year-old Escanaba resident Douglas Buskirk, who was also charged with false pretenses, is scheduled for a probable cause conference on Thursday, December 1. Police authorities said that all of the cases combined make $187,000 in total fraud loss. If you are recuperating from a debilitating disability and have lost the ability to work, seek financial assistance from the government by filing for Social Security disability benefits. 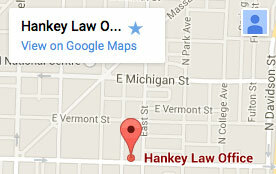 With the help of our attorneys at The Hankey Law Office, who provide legal services for clients in Indianapolis and other areas of Indiana, we can get you the compensation you need to keep on working. Find out more by calling our offices today at (800) 520-3633.